Jaydnb is a mom owned and run business that offers a variety of great products for your child. From their site :Jaydnb is where you will find the hottest fashion accessories, from preppy/'blingy" ribbon belts for both boys & girls, hair bands, non-slip hair clips, mommy & me matching aprons, & picture fram es to capture all those special moments.Our products are made with your active toddler in mind, so rest assured they can withstand a growing toddler's "constructive" and "creative" lifestyle.Our products are made with your active toddler in mind, so rest assured they can withstand a growing toddler's "constructive" and "creative" lifestyle. The first thing I noticed when I received my belt was the cute and creative way the belt was packaged (see photo on right). I also received the matching headband that was adorable and constructed very well to where it would be comfortable for your little one to wear. 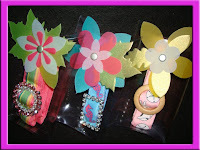 They offer over 100 different styles in their ribbon belts for boys and girls. I am sure with their selection you can find one that is perfect for your little one. WIN A Ribbon Belt from Jaydnb ! Visit Jaydnb, then leave a comment letting me know which boy/girl belt you would pick. One winner will be chosen! I will be using a random number generator to select the winner.Contest ends at 11:59pm CST on Sunday February 22,2009.If the prize is not claimed in 48 hours a new winner will be chosen.Contest open to U.S. residents only.The winner will be announced on my blog(and emailed)Monday February 23,2009. I would choose the Butterfly World belt!! Every little girl I ever KNEW (including myself) loved horses. So I'd love to get my niece Jaydnb's "Chincoteague Round Up" belt. My daughter *is* the Fashionista, so of course the Fashionista belt would be the one for her. Lots of cute styles, though, she'd probably want a few. Madison Avenue is the one that I would pick. I like the Boca Bubble Gum belt. Hannah Banana and Leifers are adorable!! I adore the going back to cali belt so cute for my grandaughter thanks. I love the "Rock Star" belt! It's hard to choose though, there's so many great belts. I like the Vegas Baby belt. I would get The Rock Star Belt for my daughter. Thanks. I really love the bright colors in the juju bee belt! Thanks for the giveaway! I have a six year old who would LOVE the GI Joe belt. I would love the Boston Whaler! I'd love the MVP belt for my little guy. I like the Rock Star. I'd like to win the Madison Avenue Belt! Thank You for such a cool giveaway! My son would like the GI Joe belt.